Sales of saunas and steam rooms significantly increased compared to last year’s figures, with saunas being a particular area of growth. Erik Soderlund, Technical Sales and Account Manager at Golden Coast, attributes this in part to changing public trends. “There is a growing market for saunas as people are becoming more aware of the health benefits, and we are seeing a mix of domestic and commercial use,” he said. “Products like the Tylö Harmony range are very popular due to the ability to customise them.” Golden Coast recently hosted a sauna and steam CPD (Continuing Personal Development) course. The one-day programme catered to trade delegates with a range of experience, including representatives from large suppliers as well as customers from smaller businesses looking to increase their familiarity of saunas and steam rooms. 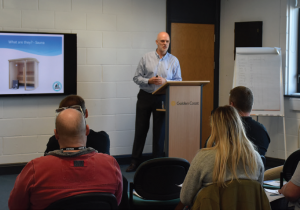 The highly successful course covered various topics such as ventilation procedures and installation guidance, and offered technical troubleshooting advice, with delegates receiving a certificate as recognition of the day. The course will be next available in the autumn.